Newport News, Va. – Janice Fisher Swain, age 82, departed this life on April 4, 2019. She was born in Champlain, VA to her parents Maynard and Violet May Fisher on the family farm. The family farm continued to be her “happy place” her entire life, as that is where she and her five siblings would routinely gather to celebrate life victories, commiserate in grief, ring in holidays, play cards, fish, play jokes on one another, and recharge in the serenity of the land and the beauty of the Rappahannock River. When she was with her family she was in bliss. She grew up in Richmond, VA and graduated from John Marshall High. She met the love of her life Raymond C. Swain while working in Grants Department Store. Upon their marriage they resided in many different states while raising their family, but Virginia always remained home and a piece of her was missing while being so far from family. In 1974 her dream came true and they relocated to Newport News. She was preceded in death by her beloved husband, parents, brothers Randolph Fisher, J.D. Fisher, and sister Margaret Foster. 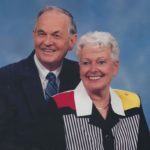 left to grieve her loss is sister Brenda Fisher and brother Allen Fisher. Her daughter Sharon Guin and “favorite son-in-law” Monty and daughter Sandra Stephenson. She was blessed and adored her four grandchildren: Jason Guin, Kevin Guin, Ashley Mack and Katelin Bonniville. Her grandchildren bequeathed her 9 great grandchildren. Her love of sports was vast as she played softball in league in Albany, Georgia and attended all of her grandchildren sports activities which included baseball, basketball, softball, and swim meets. She loved the Washington Nationals and all that knew her well knew not to visit or call when her “Nats” were on TV. Although he recently “defected” her favorite player was Bryce Harper whom she called “my boy”. She now has the best seat in the house. Her daughters would like to extend their sincere appreciation to the staff of York Convalescent and Rehabilitation Center for their dedicated devotion to their mother the last three months of her life. Although our mom adored many to whom she was a patient we would be remiss if we did not acknowledge two in particular … Nurse Mary and Nurse Rose, you will always have a special place in our hearts forever. The family will receive friends on Sunday from 3-4 PM at Amory Funeral Home in Grafton VA and a graveside service will be held on Monday at 1 PM at Peninsula Memorial Cemetery in Newport News to celebrate her life.